You are sure making progress on standardization. 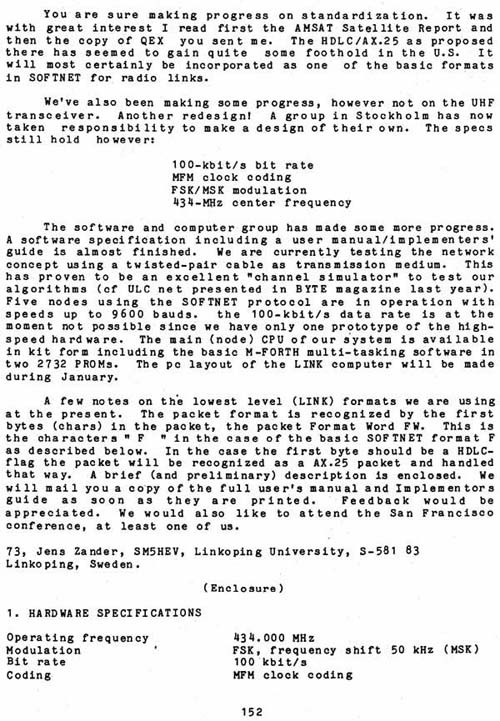 It was with great interest I read first the AMSAT Satellite Report and then the copy of QEX you sent me. The HDLC/AX.25 as proposed there has seemed to gain quite some foothold in the U.S. it will most certainly be incorporated as one of the basic formats in SOFTNET for radio links. The software and computer group has made some more progress A software specification including a user manual/implementers' guide is almost finished. We are currently testing the network concept using a twisted-pair cable as transmission medium. This has proven to be an excellent "channel simulator" to test our algorithms (of ULC net presented in BYTE magazine last year). Five nodes using the SOFTNET protocol are in operation with speeds up to 9600 bauds. the 100-kbit/s data rate is at the moment not possible since we have only one prototype of the high speed hardware. The main (node) CPU of our system is available in kit form including the basic M-FORTH multi-tasking software in two 2732 PROMS. The pc layout of the LINK computer will be made during January. A few notes on the lowest level (LINK) formats we are using at the present. The packet format is recognized by the first bytes (chars) in the packet, the packet Format Word FW. This is the characters " F " in the case of the basic SOFTNET format F as described below. In the case the first byte should be a HDLC flag the packet will be recognized as a AX.25 packet and handled that way. A brief (and preliminary) description is enclosed. We will mail you a copy of the full user's manual and Implementors guide as soon as they are printed. Feedback would be appreciated . We would also like to attend the San Francisco conference, at least one of us.